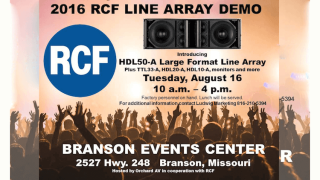 Also included in the demonstration will be the new TTL6-A active column array, SUB8006-AS dual 18² and SUB9007-AS dual 21² active subwoofers and a variety of stage monitors. Demonstrations will take place from 10 a.m. – 4 p.m. The demonstration is open to all. The Branson Events Center is located at 2527 Hwy. 248 in Branson, MO. For additional information contact Doug Prewitt, RCF event manager at 816.210.5394.